I've picked up a few deluxe edition games in the past but Tomb Raider is the first one I've ever picked up that cost almost twice the cost of the game itself. 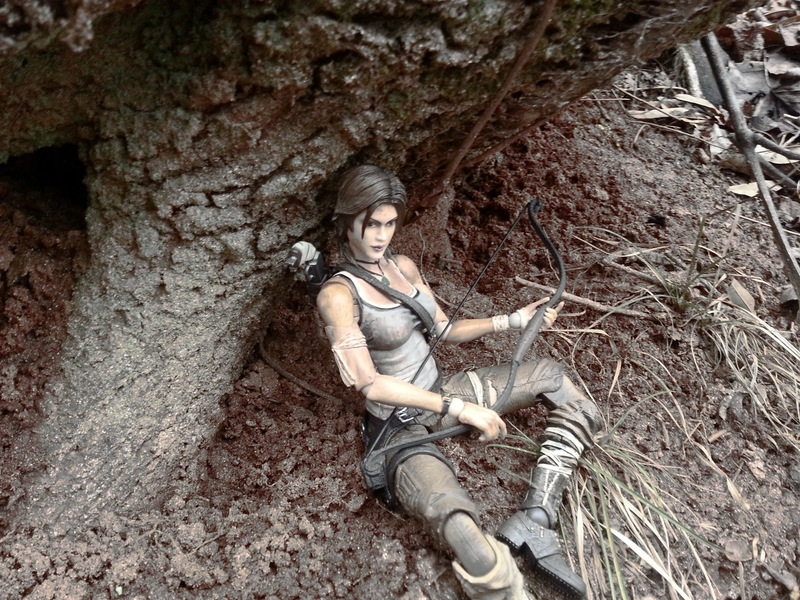 Retailing for $100, the Tomb Raider deluxe set is quite pricey. Generally the type of extras that come with deluxe video game editions just don't excite me. Lithographs, soundtracks, poker chips, and t-shirts are neat giveaways but nothing I really want to spend extra money on. These are the kind of things that used to come free with pre-orders. 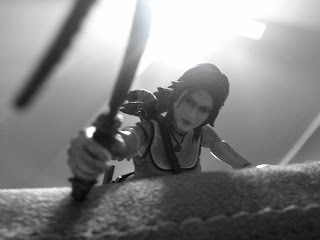 Tomb Raider, however, came with something that I was planning on buying already: The Play Arts Kai Lara Croft action figure. Priced around $65 at most online retailers and not being released until June, not only does the deluxe edition of Tomb Raider offer buyers the chance to obtain this figure now, but if you consider that the game typically costs $60, you're really getting the figure for $40, at least $25 less than buying the figure by itself (plus shipping is combined). You have to buy the figure- the attitude comes free. Lara's holding her arm because she just got a tetanus shot. 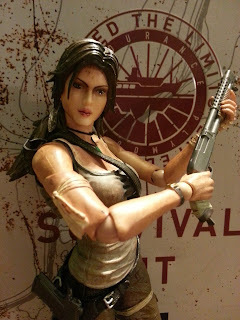 The game begins with the crash of the Endurance, a ship that the archaeological team Lara is a part of has contracted them to search for the lost civilization of Yamatai. This is a decent sized metal tin that opens on top with hinged lid. It looks old and rusty and has some textured emblems on it depicting the Endurance's logo and the survival emblems which represent Lara's skills that she obtains throughout the game. 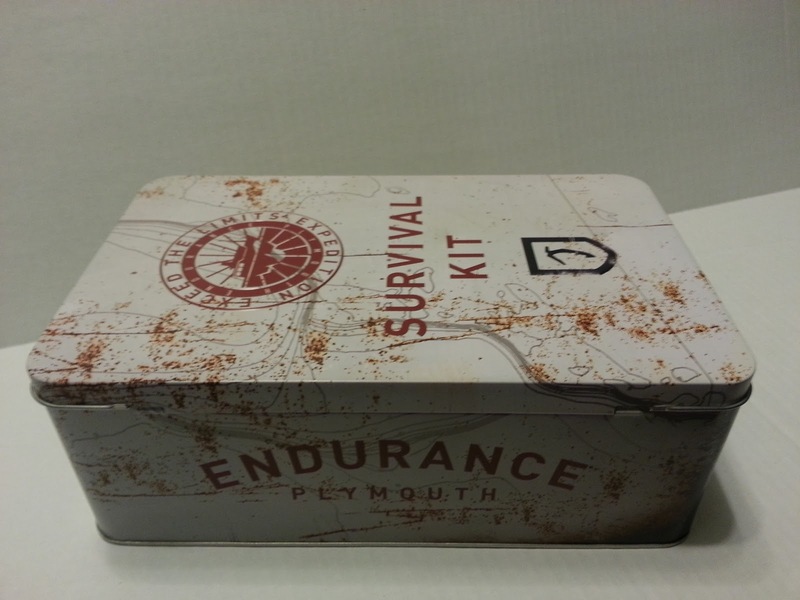 There is a simple piece of foam inside and a white cardboard tray to hold some of the items such as the lithograph and the soundtrack's case. I really like this tin. 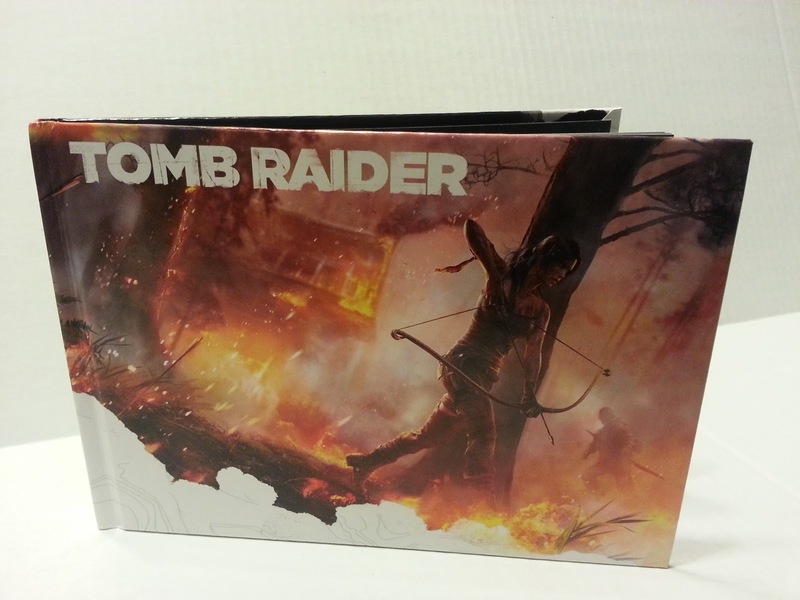 It seems like a neat storage device that has some cool in-game references, but doesn't scream "Tomb Raider." Obviously the set comes with the game, but I just wanted to mention that the game does come in its own standard case (I got the X-Box 360 version) so it'll fit just fine in your gaming shelf. One of my pet peeves is when a deluxe edition of a video game doesn't give you a regular case for the game, so I'm glad Tomb Raider did. 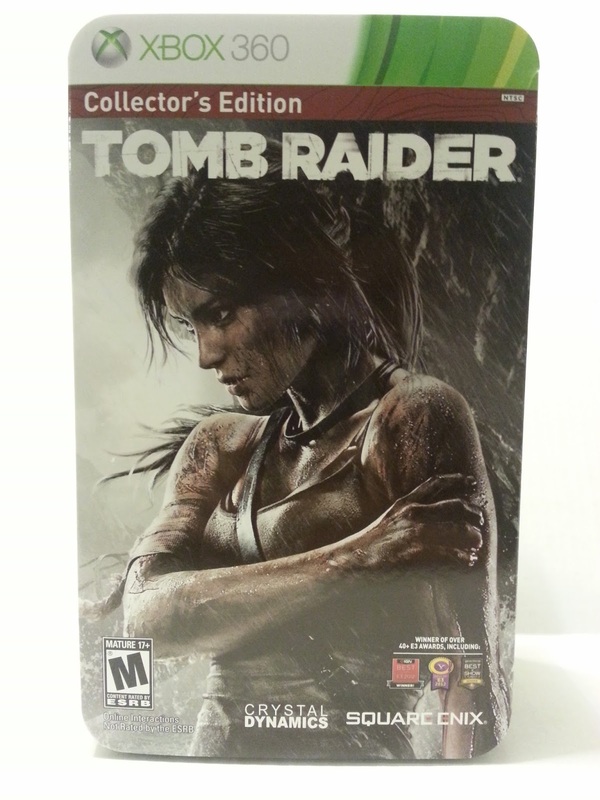 In the game case is a non-instruction manual (simply a map of the controls), a product registration card, a 14 day X-box live Gold trial membership, and a DLC pass for the Hunter skin for Lara (she's all covered in mud like Dutch in Predator) and the Shanty Town multiplayer map. I'll try to review the game in depth at a later point but so far it's amazing. This is a set of 3 shield shaped black and white iron on patches. Within the game Lara is able to "level up" by completing various tasks such as hunting, killing enemies, discovering artifacts, and through simple in-game progression. When Lara has enough experience she can choose a new skill to add to her repertoire of survival techniques, represented by a shield . 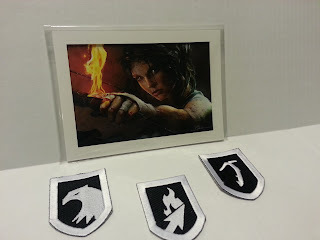 The 3 patches evidently represent 3 of these skills, although I only recognize the first one- Animal Instinct, a skill which lets Lara more easily spot animals in the wild. The first badge is for Animal Instinct. The other two are for sand racing and joining something called "Hero Squad." This is a small lithograph of Lara getting ready to fire a flaming arrow from her bow. I really have to say that all of the game's art is gorgeous- it has a very primal feel to it. Still, I'm not really sure what to do with it. It's not huge and it kind of has a heavier cardboard frame (meaning it really won't fit in a hanging frame). I guess I'll just prop it against something? Packaged in the survival tin, this is simply a glossy piece of paper. The content is titled "Hitman Absolution Weapons Pack DLC" and appears to allow Lara to use three weapons that were used by Agent 47 in the video game Hitman: Absolution. Looks like the 3 weapons are a pistol, a Spas 12 shotgun, and an assault rifle. A better name would have been "Music to Raid Tombs By." 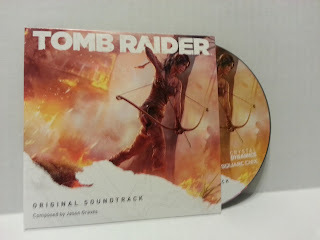 This is a CD of ten tracks from the game's score composed by Jason Graves. It comes in a cardboard sleeve with some cool Lara Croft art on it. The back has a web address for www.sumthing.com where it says you can purchase more tracks in order to complete your collection. 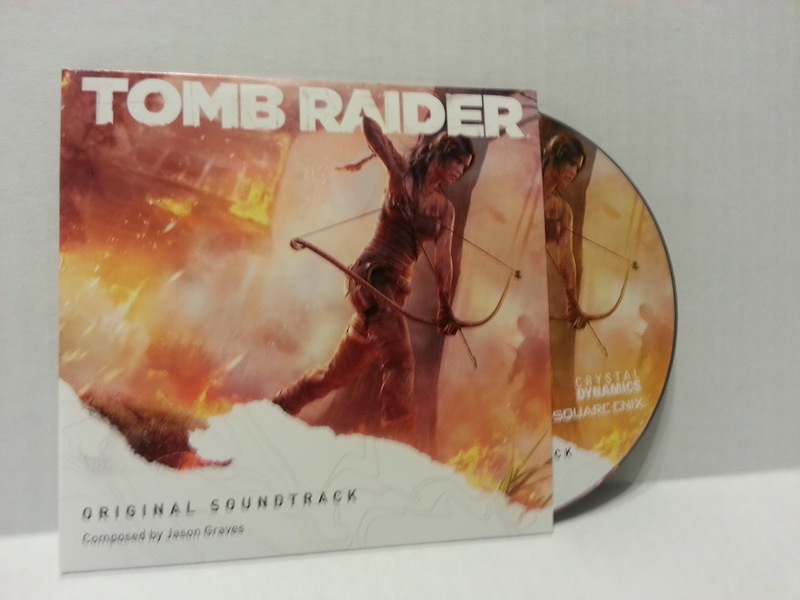 Game soundtracks usually aren't my thing, but I'm sure it's a nice inclusion for some audiophiles. This is a decent, if unspectacular, extra. 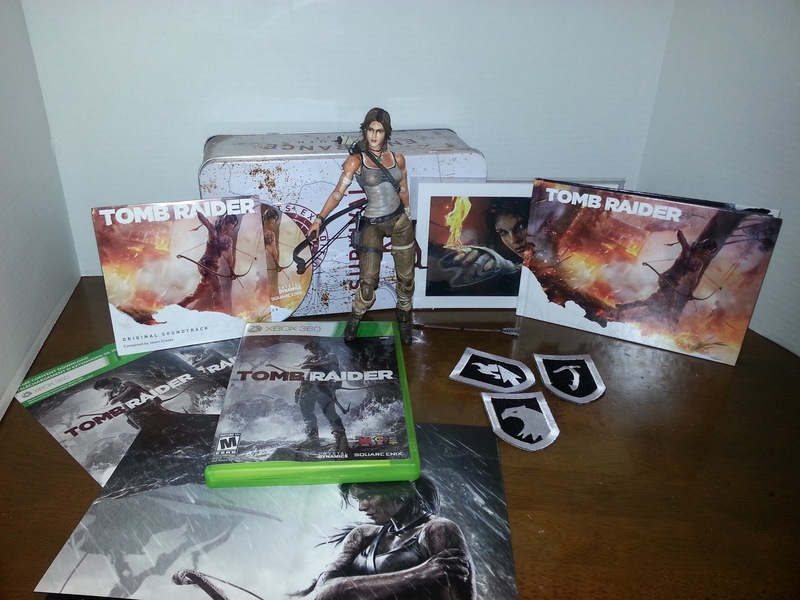 The front is a nice poster of the game's cover artwork: Lara standing in front of the various shipwrecks on the island, wielding her bow and holding her injured arm. The back is a pretty vague map of the island (it's not going to help you in-game) with some black and white images of various locales and a little text about the history of the Island of Yamatai. This isn't mentioned on the back of the package, but it's a gorgeous 30 some page hardcover book. It's only a little bigger than the 5x7 lithograph in terms of its dimensions, but it has some great artwork and character models in it. You can really tell from the concept art that lots of attention was put into the environments and the atmosphere of the game. Books are probably my 3rd favorite favorite thing to get in deluxe game editions, behind action figures and prop replicas. I have a whole shelf of art books, so this piece definitely has a home already. There's lots of fire in this game. Lots of fire, indeed. Other than the game, this was my main reason for buying this set. The figure was manufactured by Square Enix Products and is part of their Play Arts Kai line of action figures. The same figure is slated to be released this June in individual packaging and has a retail price of about $65 dollars. The Play Arts Kai figures, while having exceptional detail, do tend to have a bit of a caricatured look to them. 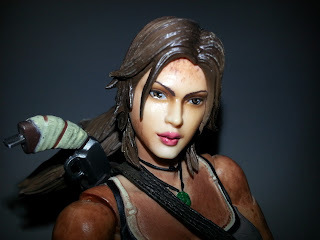 While it is unmistakable that this is Lara Croft, her face and proportions are little different from the in game look. Still, she's an incredible action figure. There is some great detail, however. Lara is covered in a moderate layer of mud and filth. Even her clothes look pretty soiled and have a few rips and tears. 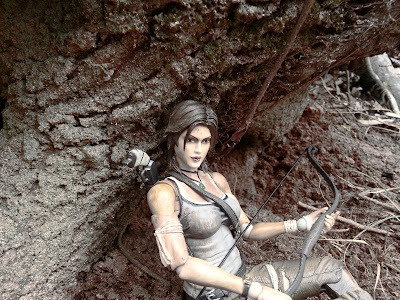 Lara Croft is kind of like Indiana Jones. Except she's better looking. She comes with a .45 pistol, a bow and 1 arrow, a sawed off shotgun, her climbing pick, and three additional hands to aid in holding different accessories. The pistol fits in a holster on her right leg while the shotgun slides into a holster slung over her shoulder. 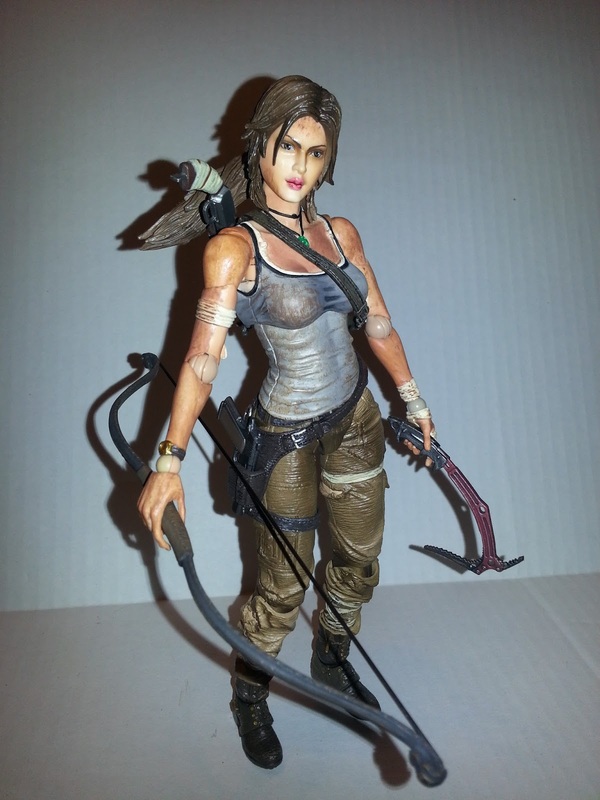 The accessories are all really well done with some nice additional paint applications, just be careful with the bow: I imagine that for many fans, the first inclination will be to try and pull the string back (Lara is even posed like this on the back of the box). Don't! The bowstring is simply plastic and seems like it could be a bit brittle with very little give. Be very careful when changing out the hands, as well. A little warm-hot water might help make them softer so they can switch easier. 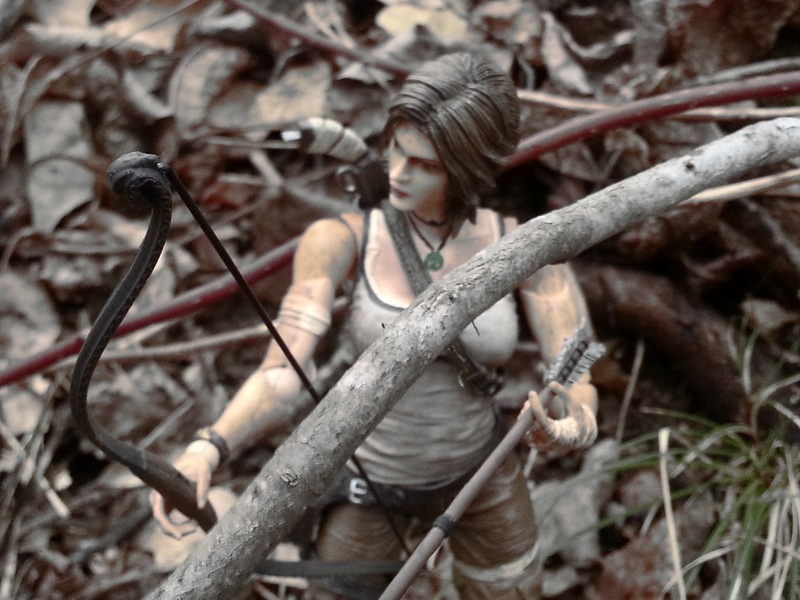 Although she wields a bow, Lara does not lead a band of merry men. Lara is very well articulated. She has swivel toes, swivel and ball jointed ankles, double hinged knees, true ball jointed hips, a ball jointed waist, a ball jointed torso, a ball jointed head, swivel ponytail, laterally hinged shoulder sockets with ball jointed shoulders, swivel biceps, swivel and ball jointed elbows, and swivel/ball jointed wrists. Be careful when posing Lara: Move the joints slowly into the position you want. Many of the joints actually "ratchet" into place to help hold poses better, but you'll still want to be careful. 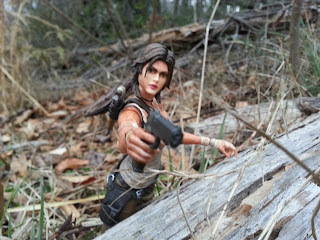 The quality seems quite good overall, however, and I'm thrilled to have this figure as part of my Tomb Raider collection. "You can look! Just don't stare!" Overall, I'm giving this set a 5 out of 5/Confirmed Epic Rating, simply because it saved me at least $25 dollars on the Play Arts Kai Lara Croft. That's a huge value considering I was planning on buying both the figure and the game. The tin, DLC, and art book are all really nice extras as well. The patches, lithograph, CD and poster are decent items, but I'm just not sure that I have a huge use for them. I'm sure I'll figure something out for them at some point. If you're interested in the game and the figure, there's no doubt this set actually is a very good value.  I'm confidently giving this set a 5 out of 5 stars, which means it is Confirmed Epic! 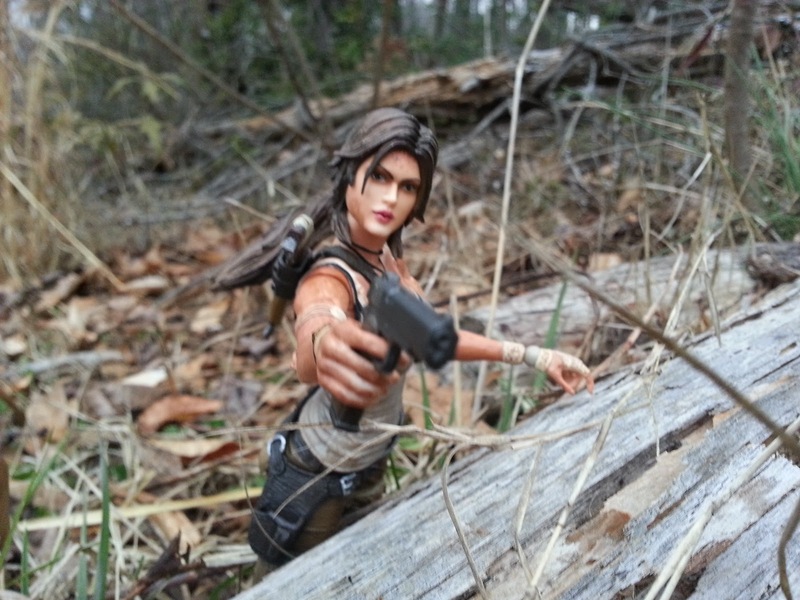 Pictured: If J.J. Abrams directed a Tomb Raider movie. Be very, very quiet. Lara's hunting rabbit. When not raiding tombs, Barbecue17 can be found raiding other locales such as the fridge, the pantry, and the local doughnut shop. He has a bunch of reviews of action figures and Lego sets on Amazon.